When I think about mixing patterns, I immediately think about Solange Knowles. She's just amazing at it and makes it look effortless. The "rules" are simple. There are only 3 of them. FYI: I put rules in quotations because I am in no way speaking in absolutes. Rules can and will always be broken. HOW DO I MIX PATTERNS LIKE A PRO? Well, I'm glad you asked! I will be focusing on the pillows in the picture example. I think pillows are a great place to start! These "rules" are meant to work together. If you follow all three, you should be able to create really great pattern combinations. You have to have an understanding of color to get the best results when mixing patterns. I suggest picking up a color wheel at your local art supply store. This will give you a greater understanding of the different color schemes such as complimentary, monochromatic and analogous. Once you understand the schemes, you will be able to create color palettes. 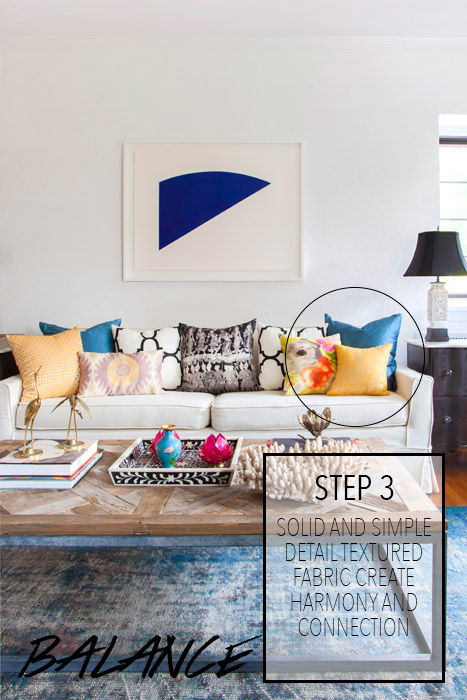 From there, you can use the color palette to choose patterned materials to produce unexpected pattern combinations that are cohesive and balanced. Erika of BluLabel Bungalow uses a color palette generator. A color theory book may be a good idea as well. The biggest fear in mixing patterns is clashing, but understanding scale can this fear completely irrelevant. When you are choosing materials/fabrics for your space, the best beginner tip I can give you is to choose one large scale pattern and one small scale pattern. The idea is to create a cohesive look. Two or more large-scale patterns can create confusion for the eye. Two or more small scale patterns can cancel one another out. The image above shows a large scale geometric patterned pillow and a small scale black and gray patterned pillow. As you can see, they don't clash. Remember when I said rules can and will be broken? In the picture example, there are actually three large-scale patterns. The reason it works is because the largest scaled pattern is black and white. Black and white patterns can coordinate with anything. Also, notice there is a separation of the patterns. Intentional spacing aids in the cohesive look. Scale and Balance are closely related. You can't mention one without the other. How do you balance out 2 or more patterns? You do it with a solid or a texture that has simple detail. Balance creates harmony and connection. From here you can add additional patterns that include the solid colors. The example picture displays this flawlessly. ARE YOU A BEGINNER OR PRO AT MIXING PATTERNS? Images from Design Manifest and Design Manifest with adjustments and text added.